Mom, the Intern: An opportunity to give AND get! An opportunity to give AND get! At this time of year, I always feel drawn towards giving to others. I experience this pull at other times during the year, but especially at Christmas. I think this is true for a lot of people. For me, it's because I am reminded of the birth of my Savior, who spent his whole life loving and serving others. He gave everything He had to people who had nothing. And then, as His last sacrifice, He gave His life so we could live again -- the ultimate gift. So often we focus on what we're going to GET for Christmas, but how often do we think about what others are NOT going to get? One thing I know for sure, and that is this: there are far more have-nots in this world than haves. And WE possess the power to change that. A few days ago, I mentioned that I have a friend in need and that I wanted to do something for her. But I am enlisting your help; together, we can do so much more than I could ever do alone. As the High School Musical kids say, "We're all in this together" and I believe that to be true with all of my heart, as corny as it sounds (especially when crooned by Zac Efron. Who is prettier than me. And that's weird). So first, I'd like you all to meet Stacy. Stacy has had an extremely rough year, to say the least. In July, she found out she has a very rare and painful cancer called sarcoma A few weeks after her diagnosis, her husband lost his job. Since July, Stacy's endured extreme pain and heartache. 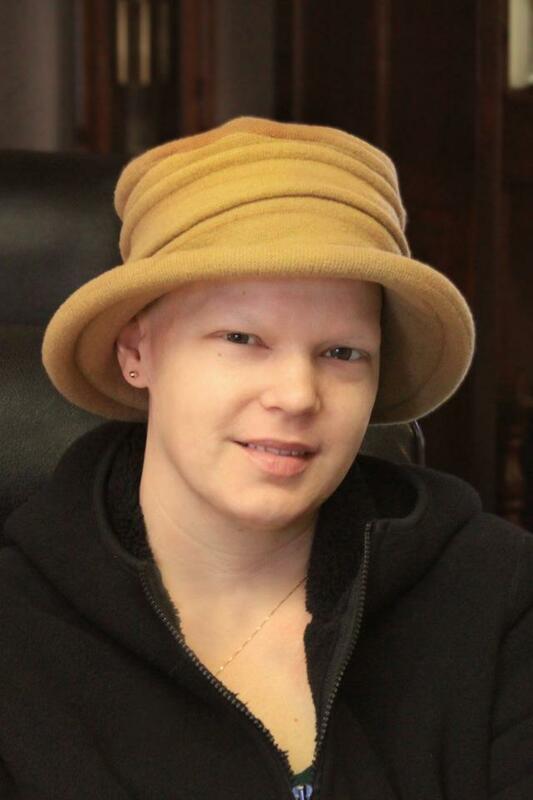 She's been traveling about 2 1/2 hours each way to receive intense treatments for her cancer. She doesn't get to see her kids much and she has to be careful about going out in public since her immune system is so weak. Needless to say, Stacy's heart could probably use a little lifting. On Monday, December 5th (that's in three days), come to this here blog (hopefully you have it bookmarked, or better yet -- you're a follower!) so you can bid on some AMAZING, FANTASTIC, ADORABLE and SUPER-COOL items featured in a benefit auction for Stacy! -Photography sessions in Utah and Arizona! -Haircut and color packages from both Utah and Arizona stylists! -Ad space from some big-time bloggers! -Handmade crotchet items (blanket, baby elf hats)! Seriously, what a great way to do your Christmas shopping. You get some AWESOME swag and you're helping someone out in return. I hope to see you all here on Monday! In the meantime, I've gotta get my voice warmed up: The long-awaited EVMCO Christmas concert is upon us! Hope to see you at the Mesa Arts Center tonight ... both shows are SOLD OUT. Will your face be in the crowd? What a truly worthy cause! Can't wait! Ps break a leg tonight! I'm so sad I can't come see you sing! I wish I lived in the area. I'll definitely be back on Monday! I was curious how you donate for the sale? I am a photographer in the Raleigh, NC area and I would love to participate in helping by donating my services. I do something called Racks with my son (it stands for Random Acts of Christmas Kindness) and each day of Advent he has something to open on his "Advent calendar" that will lead him to be kind to someone. I am doing the same thing for myself. Please let me know how I can help as I would love to be involved! I would donate something and I'll bid too. Let me know!